Having a party? Need a fun idea for drinks? Forget that bucket of ice water and beer! Instead, treat your guests to a bourbon tasting bar. And guess what — we’re letting you in on how to set one up at home, right in your backyard. Treating your guests to a selection of Bourbons is a fun and civilized way to spend an evening, with the added benefit — whatever they don’t drink stays at your house for later (#winning). After a hot summer day, as the sun sets and the fire is blazing, there’s nothing like a decent bourbon to get you relaxed and ready for the evening. To make things easy, here are some free printable signs to put out at the bar, to help your guests choose. Also, check out the printable information sheet for conversation starters! Click the links below to download and print! Find a sturdy table, and cover with a tablecloth, burlap, or covering if the table isn’t up to snuff in the beauty department. Set your glassware to one side of the bar. You can use Glencairn glasses, rocks glasses, or any smaller-sized glasses you have. Have an ice bucket and tongs for those who want their bourbon the rocks. If you’re feelin’ fancy, have some optional garnishes pre-cut: lemon, lime, or orange peel zest. Are you an avid collector of vintage decanters? Feel free to pour the bourbon into your decanters. Just make sure to line them up with the correct tasting note sign in front. We’ve picked out some of our favorite backyard Bourbons, and we’ve broken them down into five categories to help you make a decision. 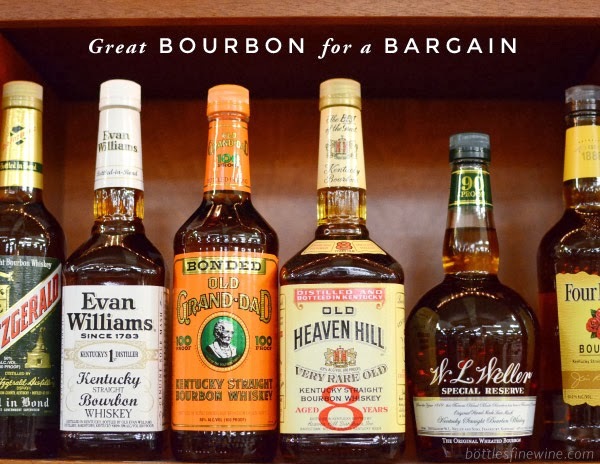 To make the tasting more varied and interesting, try to find one bourbon from each category – small batch, high-rye, wheated, bottled-in-bond, or single barrel. While there’s no real meaning to the label ‘small batch’ in terms of federal approval, the real small batch bourbons are easy to pick out in a tasting. Most distilleries age their whisky and then, when it’s ready, blend it all together in a big vat to put into bottles. A small batch Bourbon is made from whiskies whose barrels (through whatever blend of alchemy, magic, expertise, & luck) were particularly good, as selected by a master distiller. Some distilleries, like Evan Williams, release both (Evan Williams ubiquitous black label and Evan Williams 1783). Other distilleries, like Elijah Craig, make only small batch whiskies (try Elijah Craig 12 Year), focusing on age & flavor. Four Roses Small Batch – Made from four of Four Roses proprietary Bourbon recipes (2 corn and 2 high-rye), this well-balanced whiskey has subtle notes of cocoa & spice. Great with richer fare, like sausages & onions. By law, Bourbon must be made of at least 51% corn. The other 49% is up to the whim of the distiller. In some cases, the distiller adds a fair amount of rye to the mash, and this is a ‘high-rye’ bourbon. If you think about the difference between cornbread & a rye loaf, you’ll get the idea. Traditional Bourbon with a lot of corn: sweet & heavy. A high-rye bourbon or rye whiskey: spicy & light. A favorite at Bottles is Basil Hayden, but you should also try Bulleit Bourbon, which is a little rough & tumble, with bold flavors that kick! Basil Hayden – Light & ethereal, this Bourbon makes a great Manhattan, but is equally delicious on its own. Fun fact – the copper band that surrounds every bottle of Basil Hayden is made right here in Rhode Island. Pair with chicken or swordfish kabobs. Just like high-rye bourbon, a wheated bourbon utilizes the soft, herbal flavors of wheat to bring balance to the finished product. Be warned! For many, a good wheated bourbon is a gateway whiskey, opening up a whole new world of brown spirit exploration. Bernheim Wheat Whiskey is a great representative of the category, but if you’d like an alternative, try Rebel Yell, which is a quiet sleeper on the shelves that’s great with amaro and a slice of orange. Bernheim Wheat Whiskey – Bernheim uses at least 51% winter wheat to bring out extremely soft, sweet, slightly herbal flavors. Very good on its own and eminently mixable, this is a truly unique whiskey! Pair with grilled fish. There aren’t many bonded whiskies left in production. The Bottled-in-Bond act was enacted in 1897 in response to the influx of crummy, adulterated booze on the market that was being advertised as Bourbon. It was an effort by the government to legitimize a home-grown industry and guarantee the quality of the liquid inside the bottle. All Bottled in Bond whiskies must be made by one distillery during one single distillation season. Further, it must be aged in a federally bonded warehouse for at least four years, and must be bottled at 100 proof. The resulting whiskies are strong, but very subtle, with lots of complex spice, char, & vanilla notes. Henry McKenna is perhaps one of the best bourbons at Bottles. But, if you’re looking for something that will put some hair on your chest, try Rittenhouse Rye, a 100 proof, spicy rye. Henry McKenna 10 Year – Wow. It’s no exaggeration to say that this is one of our very favorite whiskies, from anywhere in the world. It’s warming & comforting, with a ton of nuance and character. You’re gonna want Henry in your corner on a night out (or in)! Pair with slow roasted, juicy, messy pulled pork. Much like a single vineyard selection at a winery, a single-barrel bourbon is the ultimate expression of a distillers craft and care. By some unrepeatable blend of alchemy, skill, magic, & luck, these Bourbons are pulled from barrels that are the purest expression of a distiller’s hopes & dreams. Hand selected and bottled out of one barrel, they are usually (but not always) hand numbered with the date of creation, bottling, and the barrel number. Each release will be a little different than the next, but all will showcase the best that American ingenuity has to offer, with clear, clean expressions of corn, oak, toast, spice, & vanilla. A great choice is Evan Williams Single Barrel – if you can’t find that, we also like Wild Turkey Russel’s Reserve Single Barrel, which has heady flavors of licorice, deep caramel, and a light meringue quality that pair well with dessert, then bedtime. Evan Williams Single Barrel – Hand selected by Bourbon rock-stars Parker & Craig Beam, this refined whiskey has a load of dark caramel and & toasty char, with a lush & lingering finish. Pair with: after dinner! Don’t muck this one up! As for food pairings for the bar, bourbon and backyard barbecue are a perfect match. The hot coals and smoke of the fire are akin to the char on a bourbon barrel, while the sweet, caramelized grill marks on your meat mimic the sweet corn & vanilla flavors in your glass. We hope this list helps to give you some tools and confidence when it comes to picking out your backyard bourbon. There are so many to choose from, we’ve doubtless left off some of your favorites (and a couple of ours, as well). For those who absolutely refuse to drink whiskey at your house (the ingrates), urge them to explore some other interesting & fun whiskies to change their mind. For instance, our local distillery, Sons of Liberty, makes a dry hopped whiskey in the summer that makes a killer whiskey & tonic. There are smoked whiskies, ryes, and whiskies made from non-traditional grains that can also liven things up a bit. Barring that, make sure you have a couple local brews on hand for the hold outs, and plenty of ice for your mother-in-law’s chardonnay. Your backyard bourbon barbecue is sure to be a hit! This entry was posted in Learn About Spirits, Party Ideas on August 12, 2014 by bottlesfinewine.